Sun and shadow sweep across Grosse Île and its Celtic Cross (lower left). Inset: A sketch of passengers on board a ship. The 19th century saw vast numbers of immigrants come to Canada in search of a better life. The majority found it. But for some, the journey to a new beginning ended abruptly. Thousands died shortly after leaving their native land, either on overcrowded ships or in squalid quarantine stations. The cause of most deaths was disease, especially the great levellers cholera and typhus. Today, the peace and beauty of a small island in the middle of the St. Lawrence River near Quebec City belie the great tragedy that unfolded there almost 160 years ago. The heart-rending events of the 1847 shipping season make for one of the saddest stories in Canadian history, one that resulted in the tiny isle being called the most westerly Irish cemetery in the world. Despite the island’s small size–a mere one kilometre wide and three kilometres long–it was named Grosse Île, meaning Big Island. For much of its early existence, the island’s low, heavily wooded hills remained virtually uninhabited. Then, events in Europe conspired to dramatically increase its population. After the end of the Napoleonic Wars in 1815, growing numbers of immigrants left the British Isles to settle in British North America, as Canada was then called. Many came from society’s underclasses, escaping the squalor of crowded cities or hardscrabble subsistence farming. Poor, underfed and sickly, the people were susceptible to disease, especially the widespread epidemics of deadly infectious diseases then sweeping through Europe. After a major outbreak of cholera in Britain in 1831, Canadian authorities feared immigrants arriving via the St. Lawrence the next year would bring the disease into the country. 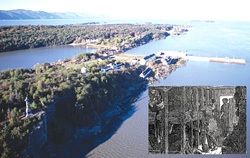 In February 1832, the Assembly of Lower Canada (Quebec) decided to establish a quarantine station on Grosse Île. At the time, most immigrants coming into Canada did so through the port of Quebec. Grosse Île was an ideal location to examine them because it was only 48 kilometres from Quebec, astride the shipping route and at a safe distance from the local population. In the spring of 1832, medical staff, soldiers and workmen began arriving on the island to set up the station, including a hospital and two shelters or “sheds” that could each hold 300 healthy people. That summer, the first cases of cholera were discovered and it took until November before medical authorities contained the disease. The quarantine station had survived its first test, and for the next 15 years, it was able to carry out its responsibilities relatively peacefully, despite an additional outbreak of cholera in 1834. But nothing could have prepared the staff for the events of 1847. In a sense, it began with the lowly potato. During Oliver Cromwell’s occupation of Ireland in the mid-1600s, the Irish were driven into the western part of the island where it was too wet for grain to ripen. The potato was the solution. It allowed the Irish to survive, but created an almost total dependence on one crop. The potato also enabled the Irish population to grow rapidly. By 1841, it had tripled to over eight million in less than 100 years. Ireland became the most densely populated country in Europe, crowded with small tenant farms that could not be divided any further. Despite its many advantages, the potato had one great drawback: it was subject to disease. In 1845, blight caused almost total crop failure. Ireland suffered the most because it was more dependent on the potato than any other country. Heartless English landlords and their agents aggravated the situation. Their response, and that of the government, was slow and inadequate. In 1846, the crop failed more completely than the previous year’s, followed by the worst winter in memory. People ate anything they could find–rotten potatoes, seaweed, nettles–then died of starvation. The prevailing–and cold-hearted–government view was that Ireland should be self-sufficient, and the provision of free or cheap food would deprive private enterprise of its rightful profit. The authorities eventually set up soup kitchens, but provided soup as cheaply as possible, without any regard to its nutritional value. Additional atrocities followed. Some landlords evicted their tenants in order to turn the land over to grazing. Dishonest agents cheated the poor farmers. For those who could, the only solution was to leave Ireland. Many Irish chose Canada, hoping to slip across the border into the United States at the earliest opportunity after that country enacted various regulations to keep British immigrant ships out of American ports. Thousands of immigrants, already in a weakened state, became ill while awaiting embarkation or in the fetid, crowded holds of ships, most of which lacked potable water or edible food. A ship with 400 or more passengers might have over 100 die in the time it took to cross the Atlantic, usually from six to nine weeks. Most immigrants travelled in timber ships, vessels that had carried Canadian lumber to Britain and normally returned empty. Now they carried a living, paying ballast in storage holds not intended for humans. At Grosse Île, new hospitals could accommodate 200 patients (there had never been more than 100 at a time previously), while extra sheds could shelter an additional 800. The medical superintendent was Dr. George Mellis Douglas. His son, Dr. Campbell Mellis Douglas, joined the British Army and earned the Victoria Cross in 1867 in the Andaman Islands. On May 14, 1847, the sailing ship Syria arrived at Grosse Île after a 46-day journey from Liverpool. Nine of her 245 passengers had died en route, while an additional 52 were suffering from dysentery or typhus. By May 23, the island’s hospitals contained 530 sick, with 40 to 50 deaths a day. Over the rest of the summer, a steady stream of immigrants continued to arrive, most of them weak with hunger and ravaged by diseases, particularly typhus. When the shipping season ended six months later, over 440 vessels had carried nearly 100,000 people to Canada. Six of every seven were Irish. Of the total, 5,293 died during the crossing or in quarantine on their ships, while 3,452 died at the station. Another 8,732 died in hospitals throughout Quebec and Ontario. Nearly two immigrants in 10, most of them Irish, never had the chance to make a home in their new country. As more and more ships arrived with more and more passengers, many of them ill, Dr. Douglas, his staff and facilities on the island were soon overloaded. Throughout the summer and early fall, authorities tried to cope by immediately providing tents, followed by additional hospitals and sheds. Unfortunately, there were not enough people to erect the tents as many workmen refused to go near the hospitals. There are three cemeteries on Grosse Île, containing 7,756 burials. The largest–known as the Irish Cemetery–is in the western section. More than 6,000 victims are buried here, including 5,424 from 1847 alone. Previously, burials on the island took place in individual graves. Overwhelmed by the numbers requiring burial in 1847, authorities resorted to mass graves. Bodies were placed in coffins, which were then piled three-deep in the ground. There was so little soil available on the island to cover the mass graves that boatloads were brought over from the mainland. Additional doctors, workers and clergymen continued to arrive amid the chaos, but it was frequently a case of too little, too late. When accommodation on shore was insufficient, the healthy had to remain on board with the sick and dead until authorized to disembark. Even the island’s Catholic and Anglican chapels were converted into hospitals. In June, 91 ships stopped at Grosse Île, resulting in at least 15,000 immigrants in quarantine at any one time. Of those, at least 2,000 were sick. The highly contagious typhus took its toll on staff, as dedicated doctors, orderlies, nurses, workers, policemen and clergy fell ill. Several died. When word spread of conditions on the island, it became harder and harder to recruit new staff. July and August brought more ships–and more sick immigrants. Numbers in hospital rose from around 1,450 in July to over 2,000 the next month. Despite more stringent quarantine regulations in mid-July, new outbreaks of typhus continued to occur, with 225 to 325 people dying per week throughout August. Finally, in September, numbers of arriving immigrants began to decline and the average daily number of sick in hospital fell to 1,330. The chapels went back to their original function and the number of medical staff was reduced. With the approach of winter and the end of the shipping season, authorities evacuated the remaining patients to Montreal and Quebec and most of the staff left the island. Grosse Île’s season in hell was over. Grosse Île continued as a quarantine station until 1937. During and after World War II, it was the location of a Defence Research Board establishment that conducted biological warfare experiments. In 1956, the Department of Agriculture took over the island and used it as a quarantine station for imported animals. Given Grosse Île’s significance in Canadian immigration history, the federal government recommended in 1984 the establishment of a national historic site there. Planning commenced on the most appropriate way to commemorate the island’s story, centred on the theme of Canada: Land of Welcome and Hope. In the public consultations that followed, a large part of Canada’s Irish community and others expressed anger over what they saw as an attempt to gloss over the distressing events of 1847. Their petitions were successful, and today the island–now known as Grosse Île and the Irish Memorial National Historic Site of Canada–tells the full story of the events that happened there. Nearly 30,000 people visit each year, travelling by shuttle from one end of the island to the other to stop at several preserved buildings, many containing artifacts and displays. Perhaps the most moving part of the island is its western end, centred on the events of 1847. The Irish Cemetery is there, marked by a few stark white crosses. The cemetery’s long, undulating mounds and furrows attest to the mass graves. Nearby is the Monument to Physicians, a small stone pillar raised by Dr. Douglas to honour six physicians who died between 1832 and 1847. Another memorial is the Celtic Cross–one of Ireland’s major symbols–erected by the Ancient Order of Hibernians in 1909. The 14-metre-granite monument stands on Telegraph Hill, the island’s highest point, and commemorates those who fled the Great Irish Famine. The final tribute dates from 1998, when a memorial was inaugurated overlooking the cemetery. It pays tribute to the immigrants, largely Irish, and the station’s employees who were buried on the island between 1832 and 1847. Because of the involvement and dedication of several people, Grosse Île today accurately portrays one of the saddest stories in Canadian history, while respectfully commemorating those who died attempting to find a better way of life in a new land.